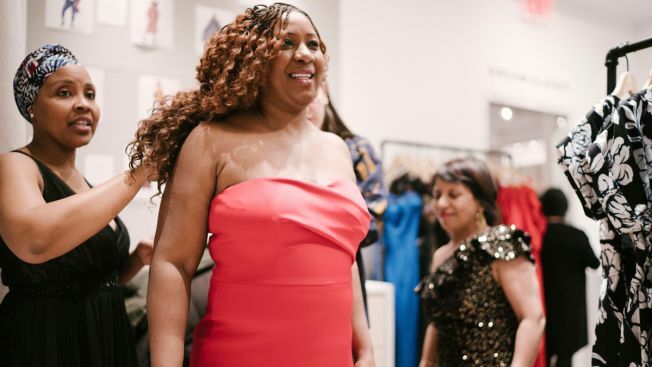 In this photo provided by Survival Media, women who work in the domestic industry try on dresses for Oscars viewing party at Rent The Runway on Wednesday, Feb. 20, 2019 in New York. Dozens of domestic workers will be honored this Sunday, Feb. 24 as the "heroes of our homes" in a red carpet event organized by the National Domestic Workers Alliance with the support of the director of “Roma”, Alfonso Cuarón, and the assistance of figures such as activist Tarana Burke and actresses Diane Guerrero, Eva Longoria and Olga Segura. Doris Tapia never imagined that she would get to watch the Oscars at a party in Los Angeles, exchanging the sneakers she wears when she takes care of children in New York for a pair of high heel shoes. The Peruvian nanny is among dozens of domestic workers who will be honored Sunday as the "heroes of our homes" in a red carpet event organized by the National Domestic Workers Alliance. The event also has the support of "Roma" director Alfonso Cuarón, activist Tarana Burke and actresses Diane Guerrero, Eva Longoria and Olga Segura. "It is a privilege to be part of this event. I could have never imagined I would be stepping in a place like this," Tapia said in Spanish, shortly before her trip to Hollywood. "And yesterday trying our dresses on! It was such a lovely experience of camaraderie," she added later about the garments donated by Rent the Runway. The Mexican movie "Roma" is nominated for 10 Academy Awards and stars Yalitza Aparicio as Cleo, a domestic worker for a Mexico City middle-class family in the turbulent early 1970s. It has given domestic workers global visibility and started a conversation about the importance of their job after years of being poorly paid and underappreciated. "There are 2 million women who do this work and are not protected by our labor laws," said Ai-jen Poo, executive director at the alliance, an organization founded in 2007 that promotes the rights of domestic workers in the Unites States. "They are taking care of our families, but they can't take care of their own families doing this work," she said. "We think this is a huge opportunity to expand our support for making these jobs dignified jobs and for valuing" the workers. Inspired by his childhood, Cuarón has dedicated "Roma" to his nanny Libo. Since its August debut at the Venice Film Festival, where it earned the Golden Lion, it has received accolades and awards at the Golden Globes and the British film academy's BAFTAs, among others. Meanwhile, the director has advocated for domestic workers' rights and has spoken against racial discrimination in Mexico, where the success of Aparicio — a newcomer of indigenous origin and the daughter of a domestic worker — has generated derogatory remarks. Cuarón recently made a public service announcement calling on employers of domestic workers to "pay fairly, set clear expectations, and provide paid time off." He also invited support of Domestic Workers Bill of Rights, a legislative effort to provide rights and protection denied for decades, as well as use of Alia (https://www.myalia.org/,) a benefits platform for housecleaners created by the alliance. "If it wasn't for the work that domestic workers were doing in homes ... (other) people wouldn't be able to go do other jobs," said Monica Ramirez, gender justice campaign director for the alliance. On Sunday, the organization will be celebrating "Roma" as a "beautiful movie" and because of its social impact. Poo noted that the film made the experience and work of Cleo visible and also humanized her. "It reminds us that women who do this work are women — they are mothers, they are friends, they are daughters," she said. "She's a whole human being, and those stories are so invisible in our popular culture. So we celebrate the film." Tapia, who moved to the U.S. almost two decades ago, had attended the premiere of "Roma" at the Lincoln Center in New York, where "there was no shortage of tears," she said. She expects to see the film win multiple Academy Awards. "But in fact, to me it is already a champion," she said enthusiastically.